In my previous blog when I told you about the book written by Elaine Merckx and Neal Rigby – ‘Some Other and Wider Destiny – Wakefield Grammar School Foundation and the Great War’. Continuing the Wakefield Grammar School theme, I thought I would tell you about one of the young men mentioned in the book. I have looked at every photograph in the book and there are many including a number of sports-related images, I was drawn to the photographs of the men and boys in the Roll of Honour section. As with any collection of photographs, there is always one that stands out from the crowd – this time it was the turn of John Laurence Young Ottley, not because of his name but because of the uniform he was wearing. John Laurence Young Ottley was born on April 20th, 1898 and baptised in Wakefield Cathedral on June 3rd of the same year. He was the son of John Bickersteth and Margaret Ottley nee Wray. 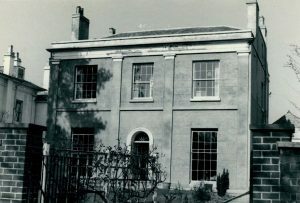 The family lived at 6 Bond Terrace, Wakefield. His father giving his profession as Solicitor and Official Receiver in Bankruptcy. Three years later in 1901, at the time the census was recorded, the family were living at 1 Hatfeild Street, Wakefield. John B Ottley gave his age as 56 and being born in Acton, Suffolk. His wife, Margaret, was 36 years of age and born at Newmillerdam, Wakefield. Young John, now aged three had an older sister, Sarah M B (Sarah Margaret Bickersteth) Ottley, well older by one year! Also living with the family was Margaret’s elder sister Ann Wray. The 1911 census gives a lot more information than previous documents of the same kind. This census is, however, allows for the head of the family to add or exclude information they deem fit. For example Mr Ottley, not only writes that he is the head of the family he includes ‘Head of the family’. He tells that he and his wife have had five children, but one has died. Although all the ages of John’s children are included he seems fit to add that ‘all under 15’. Mr Ottley and I feel by his writings in the census that I should call him Mr Ottley adds that he is both a worker and employer clerks and that he works at his offices at 6 Bond Terrace, which at one time was the family home. Mr Ottley seems to have been a bit of a ‘stickler’ as he goes on to tell that Newmillerdam was at Sandal, nr Wakefield. He tells that he and his family are ‘British Subject by parentage’. He includes their 16-year-old servant from Ackworth, Margaret O’Hara as a British Subject. In the final column, he writes ‘None of the Residents in this house are either wholly or partially Blind deaf or dumb lunatics or imbiciles DG JDC (initials)‘. Home for the family at this time was 12 Wentworth Terrace, Wakefield, a nine-roomed house. This house does seem to fit in with the status of the family, as John Bickersteth and Caroline (Agnes) were two of the children of Laurence Ottley (and his wife Elizabeth Bickersteth), who in turn was the son of Sir Richard Ottley (and his wife Sarah Elizabeth Young). By visiting Britanniasquare.org, it seems I may have answered one of my queries – where did Sarah Margaret Ottley go to school. By browsing this website I think I have found out! One image shows the tennis courts of a local school, the Alice Ottley School, now Royal Grammar School Springfield, could she have attended this school named after a relative, which was just a short walk towards the centre of the square? Alice Ottley was the first headmistress of the school. 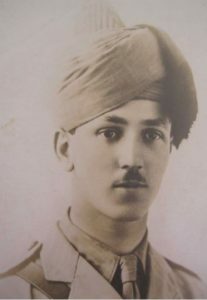 Ottley, John Lawrence Young, 2nd Lieut., 56th Punjabis Rifles, Indian Infantry, Indian Army, eldest s. of he late John Bickersteth Ottley, Registrar of the Court of Birkenhead, by his wife, Margaret (14, Euston Grove, Birkenhead), dau. of John Wray ; and nephew of Rear-Admiral Sir Charles Langdale Ottley; b. Wakefield, co. York, 20 April, 1898; educ. The Grammar School, Wakefield (Scholar); Cathedral King’s School, Worcester (Scholar); gained the 21st place in the Indian Cadetship Examination in Aug. 1915; sailed for India the following months and engered the Royal Military College, Wellington, India; was gazetted 2nd Lieut. 1 April, 1916; joined Regt. at Jullundur; served with the Indian Expeditionary Fore in Mesopotamia from 1917, and was killed in action near Instabalat 22 April, 1917. A brother officer wrote: “He was only out here with us for a few weeks, but I saw enough of him at that time to be sure that he would have made a fine officer had he lived. On April 22nd he was with the leading line of the regiment, which had advanced over half a mile of open ground and took the Turkish front line. It then went on towards a second position, but the Turks counter-attacked, and, lining a railway embankment on the left, poured a heavy enfilade fire into our men. Captain Watson and your son, with three Indian officers, were killed at once, as well as a number of men. Very few got back to the captured trench. Your son was shot through the shoulder and leg, and died almost instantaneously. He and Watson were buried in the same grave next morning, near Instabalat Police Post, by a Church of England clergyman. An officer of the regiment at present on the Staff attended, and has marked the position of the grave. We all feel the deepest regret at the loss of such a gallant and promising young officer, and wish to express our sincere condolences with your in your grief” Unm. It seems this young man came from a very interesting family with connections to many countries. This entry was posted in General on February 17, 2018 by carol. The Great War took a great toll on the public and grammar schools of Great Britain. Many young men left school in the summer only to be lost to their family and friends by the winter, while others had had careers and families of their own cut short by injuries or death. ‘Some Other and Wider Destiny – Wakefield Grammar School Foundation in the Grear War‘ by Elaine Merckx and Neal Rigby have delved deep into the vast archives of the Foundation to bring photographs, documents, minutes, The Old Savilian (the School magazine) and eyewitness reports together in this study of The Great War and its effect on life in both the boys’ school and Wakefield Girls High School and surrounding city. The book, nearly 500 pages, informs the reader of the background of both schools telling what life was like at school in Wakefield. Listed within the pages are the names of approximately 200 ‘Old Girls’ who did work of national importance in various forms. For example, Sophie Appleyard did clerical work at the County Hall, as did Isabella Loudon and Janet Mcqueen Loudon. While Eva Bates was Private Secretary to the Inspector of the Government Shell Factories, Leeds. Marjorie Bygate did work at the United Counties Bank to replace a man at the Front. Many others were part of the VAD (Voluntary Aid Detachment) and did work of varying natures around the country. Some like Nancy Evelyn Walley was nursing in France by 1916. Mabel Kitson, it seems went farther afield, working in the Diplomatic Service at the British Embassy, Washington. She was the first British woman to achieve this and rose to become head of a department. Others stayed local and worked on various committees, did fundraising and volunteer work, including work at Wentworth House, their former school which had been turned into a hospital. Charles Edwin Woodhead, a Private in the Northumberland Fusiliers was a Prisoner of War, as did Austin Ernest Wilson of the KOYLI. A young man named Montagu William Wood did service with the Shanghai Light Horse. The young men. The ‘Old Boy’s’. The ‘Old Savilians’ who went to war are all named with the years they attended the school, along with their final rank, regiment and any additional information. This information may include their date and place of death; any additional medals awarded i.e. Military Medal; when they enlisted; if they were wounded or invalided. Most poignant is the Roll of Honour to those who paid the ultimate sacrifice. From Lieutenant-Colonel’s to the humble private each one is remembered and in most cases, a photograph is included. These men are more than mere names on a page or a memorial, they were someone’s son, a brother, a grandson. They were part of a community, albeit a church or a school. They were part of a team, either cricket or rugby. They were a classmate. They were an ‘Old Savilian’. They were and shall always be part of the fabric of Wakefield Grammar School. Elaine and Neal have recorded every part of life at both schools leading up to and including the time of the Great War and no research stone seems to have been left unturned. It is a work of great passion and enthusiasm and is a tribute to the school, the boys and themselves. Well done! 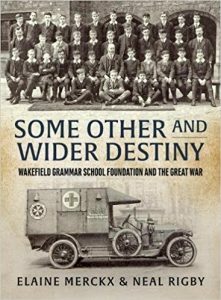 To get your copy of ‘Some Other and Wider Destiny – Wakefield Grammar School Foundation in the Grear War‘ published by Helion & Co. Ltd., you can contact either the Wakefield Grammar School office or the publisher. The book is also available on Amazon. This entry was posted in General, News on February 11, 2018 by carol.